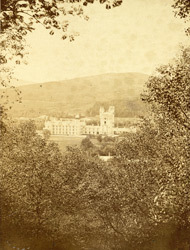 "Beneath the shadow of Craig-an-gowan, upon a sloping lawn encircled by the Dee, stands the lovely Castle of Balmoral, which, being the Summer Residence of her Majesty the Queen, is of great interest to all her subjects. It was purchased by the late Prince Consort, and rebuilt after designs by William Smith, City Architect of Aberdeen, in the old Scottish Baronial style, with modifications in some of its details. 'With rock-wall encircled, with precipice crown'd.'"